If there's one cuisine whose hype is usually warranted, it's pizza. Because of its universal nature, critics and "the people" will generally see eye to eye. At the end of the day most pizza is either fantastic or good enough and it doesn't take a food expert to distinguish between the two. With these facts in mind, The Infatuation was fired up to investigate New York Mag's declaration of Kesté as NYC's best pie of the moment. 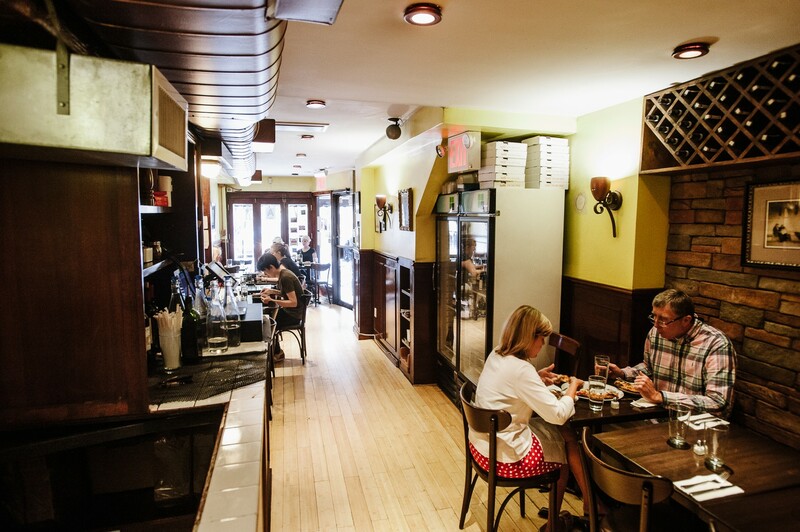 As anticipated, Kesté serves up some of the best pizza in town. We went during prime time and waited about half an hour for our table – the perfect amount of time to whet our appetites with a couple craft pints from the Blind Tiger down the block. Kesté doesn't serve by the slice (unless you're lucky and they hook you up with a taster slice for waiting), and while the pies are sized for one person to eat, you should come hungry and with friends. On our last visit, we each ordered our own pie and no slice was left uneaten. Kesté's decor could use a little spruce up -the exposed brick almost looks fake, and the random artwork doesn't add much to the vibe. They jam as many tables as possible into the small space, and it's hot as hell thanks to the open oven in the back. You know what though? I'm fine with Kesté concentrating their efforts on the food, and it pays off. I'd rather eat like a king at a dive than consume crap in a palace. Not that this place is a dive by any means, but you get my point. Grape tomato, fresh buffalo mozzarella, basil, and extra virgin olive oil. For my personal taste, this comes as close to a perfect Margherita as it gets. The crust is amazing - chewy on the inside and burnt to a crisp on the outer edges. It has the right balance of sauce with just enough cheese. I highly recommend getting this over the regular Margherita because the upgrade to buffalo mozzarella is worth the extra $3. Tomato, prosciutto di Parma, arugula, gran cru, and extra virgin olive oil. Ordering a prosciutto pie is a no-brainer, and this is the one to go with. Again, the crust was just out-of-this-world. The char that the wood burning oven creates ties the whole pizza together. My one complaint was that they were a little stingy with the prosciutto. Maybe they didn't want the pizza to be overpowered by the meat, but I felt a little slighted. Regardless, this thing is awesome. Italian rapini, Italian sausage, imported smoked mozzarella, and extra virgin olive oil. This was certainly the heaviest of all the pies we tasted. The crust wasn't as burnt or crispy thanks to the generous amounts of olive oil and rapini (broccoli rabe). The Italian sausage was cooked well and this was good stuff. Butternut squash cream, imported smoked mozzarella, and artichoke. Want a sweet alternative? How does butternut squash cream sound instead of tomato sauce? A pretty unique play here, but the butternut squash was hard to taste over the cheese and artichoke. OK, but unspectacular. Fans of smoked mozzarella will definitely enjoy this. Olio Pizza e Piu managed to get one of the worst Infatuation ratings ever. Each pizza we ordered was a mess of rubbery cheese and crust – heavy, sloppy and unappetizing.